Summary: Ballet Cat is just the tiniest bit overbearing with her enthusiasm for ballet. 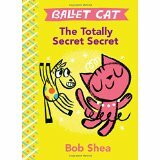 When her friend Sparkles the Pony finally admits that he doesn’t always want to play ballet, Ballet Cat shares a secret of her own. Literary elements at work in the story: The story here is told completely in cartoon conversation bubbles, so there is no outside narrator to comment on the action or to give further details on the protagonists. Nevertheless, Shea’s characterization is rich and sweet and funny. His flat cartoon illustrations against contrasting background colors show the wildly enthusiastic Cat directing the dance action, while Sparkles the Pony grows ever more dispirited. His eyes are at half-mast, and the dimishing font on his speech bubbles shows his lack of interest. Even the new readers for whom this book is written will be able to interpret the worried postures of Cat and Sparkles when they fear that a secret might harm their relationship. How does the perspective on gender/race/culture/economics/ability make a difference to the story? Ballet Cat dresses in a tutu, pearls and a squiggly tiara, but aside from an assumption based on gender stereotyping (and a summary on the back cover), the reader is never told the gender of either of the main characters. Neither do we know the ages of Ballet Cat or Sparkles the Pony. With this relatively blank cartoon slate, we are left to concentrate on a universal story of friendship and what makes it tick. Theological Conversation Partners: Ballet cat is passionate about ballet and, yes, a little bit bossy in her eagerness to dance, twirl, and leap with her friend Sparkles. However, to her credit, she is also sensitive to Sparkles’ halfhearted response to her ideas for the day’s fun and asks him what is troubling him: “A ballerina can tell these things.” Ballet Cat loves ballet, it is clear, but even more than that, she tells Sparkles in her “very secret secret,” she loves her friend. Scripture is filled with guidance for maintaining peace with our friends and within our communities. “If possible, so far as it depends on you, live peaceably with all.” (Romans 12:18) “Strive for peace with everyone, and for the holiness without which no one will see the Lord.” (Hebrews 12:14) “Let each of you look not only to his own interests, but also to the interests of others.” (Philippians 2:4) The last page of this book shows Ballet Cat and Sparkles the Pony happily playing checkers on the floor. This simple story could be a conversation partner for children, teenagers, couples, or even church committee members on identifying the most important things in a friendship or a community. Which of the two characters likes to dance? How can you tell that? Why do you think that Sparkles is worried when he tells Ballet Cat that sometimes he’d rather play something besides ballet? Have you ever worried about telling a friend something? Why were you worried? Do friends always have to like the same things? Have you ever played something you didn’t want to because your friend likes to play it? Sparkles and Ballet Cat are playing checkers on the last page of the book. What do you think they will play tomorrow? How do you think God wants us to treat our friends? Ballet Cat: The Totally Secret Secret by Storypath is licensed under a Creative Commons Attribution-NonCommercial 4.0 International License.